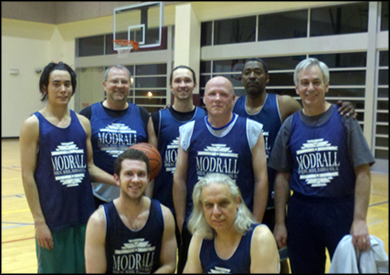 By any measure, a season in which Modrall Sperling’s cagers sweep their cross-town law firm rival and upset the second seeded team in the post-season tournament, is a resounding success, regardless of whether the several notable post-game celebration outings are factored in. The firm’s basketball team enjoys a long tradition—beginning with its most senior partners—of bringing home the hardware from Albuquerque’s lawyer-accountant league. Even in years when they are prematurely dispatched from the post-season tournament, which they were again this year after a hard-fought semi-final game (versus a stacked, numerically challenged accountant team), there is a bright side: no interruptions during March Madness, and plenty of time to prepare for the early-summer “Barbeque Ball,” hosted annually at shareholders’ homes selected on the basis of one key criterion—a suitable backyard court.